Occasionally, it’s my pleasure to get to deliver some great news here on the blog. 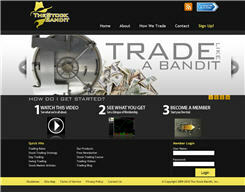 At the beginning of this year, I introduced you to the Trading Videos  site over at TheStockBandit.TV. Then in the spring, I got to show you the stock trading course  at TheStockBanditUniversity.com, a video-on-demand training course for beginning traders. Along with the new look comes the best part – new functionality. It used to be on the old site that members logged into a Member Area which was sequestered from the rest of the site. Every feature was found in a different location, which meant it was hard to navigate and easy to get confused! So head on over and check it out  – we are excited to show it off! And by the way, all the usual free resources and trading education  info made the transition too, so those pages of chart patterns  and trading strategy  outlines are still there. One last thing… we dumped our database of former members. That sounds bad, but it’s actually VERY good because you can start another free trial – even if you already received one on the old site. It’s only logical that with a new site, everyone gets a freebie. So, I’ll see you in The Bandit Hideout!